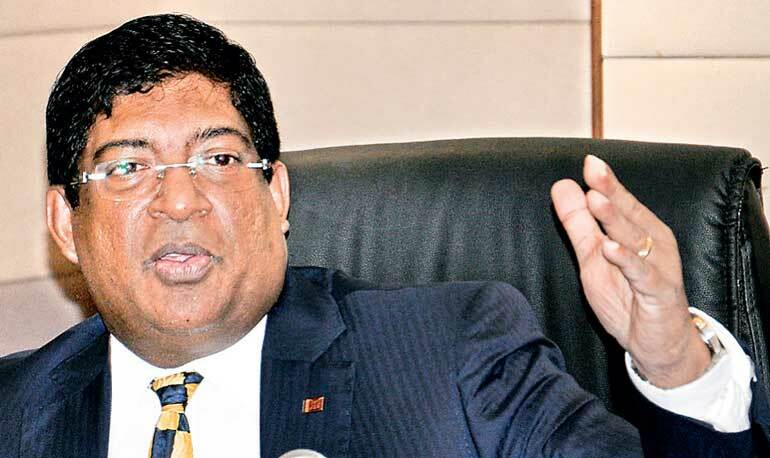 Finance Minister Ravi Karunanayake yesterday pulled no punches as he set the record straight on multiple points including the Rs. 25 billion payment to airline leasing company AerCap for cancelling four A350s, the maintenance of electricity tariffs, the submission of the Appropriation Bill to Parliament and an increase of cigarette prices. A visibly miffed Finance Minister criticised the media for what he termed inaccurate statements and insisted there was absolutely no intention by the Government to raise electricity tariffs. Responding to reports detailing a revenue shortfall of Rs. 5.5 billion projected by the Ceylon Electricity Board (CEB) in the next six months, he insisted the cost would not be passed on to the consumer and would be borne by the Treasury. The CEB this week had requested a 5% tariff increase from the Public Utilities Commission of Sri Lanka (PUCSL), which functions as the regulator of the State monopoly. “These are completely inaccurate statements. Some media are reporting that we will not be increasing cigarette prices when we gazetted the increase last night. From today the price per cigarette will increase by Rs. 7. This was a proposal that received Cabinet approval,” insisted the Minister. The Government hopes to raise an additional Rs. 22 billion from the tax increase each year. Ceylon Tobacco Company (CTC) paid the Government Rs. 92 billion in taxes in 2015, making it the largest taxpayer in the country. Total Government revenue during the first eight months was Rs. 1.01 trillion ($ 6.89 billion) or 51.6% of the year’s estimated total, Government data showed. Sri Lanka customarily collects more taxes in the second half and hopes to achieve a deficit target of 5.4% for 2016. During a hurried media briefing arranged before he flew to Washington to attend the Annual General Meeting of the International Monetary Fund (IMF), Karunanayake also dismissed concerns of a possible delay in the second tranche of the $ 1.5 billion Extended Fund Facility (EFF) program. “Everything is on track. The IMF review mission praised our efforts and we are confident of things proceeding smoothly,” he stressed, adding that the Appropriation Bill would be presented to Parliament within the next two weeks. Defence, provincial councils, health and education along with debt repayment will be the top five sectors that will receive the bulk of public resources, he added. The Finance Minister also confirmed that Mihin Lanka would cease operations by the end of October, with operational losses of Rs. 15.5 billion and capital losses of Rs. 18 billion, and be absorbed into SriLankan Airlines. SriLankan will continue to fly the 11 routes operated by Mihin but will charge fares higher than budget rates. The national carrier has also reached a deal with leasing company AerCap to pay Rs. 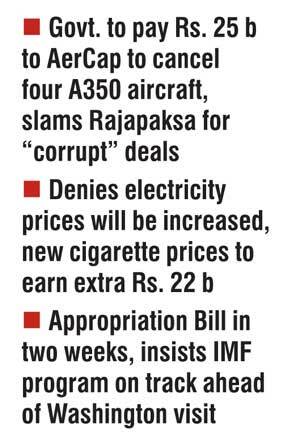 25 billion ($ 173 million) to cancel four A350 aircraft ordered by the Government of former President Mahinda Rajapaksa. “Those who ruined the economy are visiting temples today complaining that the economy has collapsed. Let me explain who ruined the economy. A colossal amount of money was spent in a corrupt and haphazard manner during the previous regime. One of the most corrupt deals among them was the purchase of A350 super luxury aircraft at exorbitant prices. Four of such super luxury aircraft are scheduled to arrive in the country soon,” Karunanayake said. SriLankan Airlines, which has taken on lease seven Airbus A330-300s since 2012, is in debt for around $ 3.25 billion. It posted a group net loss of Rs. 16.3 billion ($ 112.6 million) for the financial year through 31 March, narrowing from the Rs. 31.4 billion loss of a year earlier, due to lower oil prices. The carrier last posted a profit in 2009, a year after Emirates sold its stake in the venture. The company has also leased four of its Airbus A330 planes to Pakistan International Airlines Corp after its decision to cancel orders for four Airbus A350 aircraft.